MOVIE SYNOPSIS: This new version of the classic Rudyard Kipling tale blends live action and CGI for a wonderful re-telling of the story of Mowgli and his jungle pals. MOVIE REVIEW: I was a little worried when I heard there was a remake of "The Jungle Book" in the works. Especially one blending live action characters (basically, just Mowgli) with computer-generated images of the jungle animals. So often these types of remakes go horribly wrong. But when I heard that Jon Favreau would be directing the movie, that eased my mind. Under his skillful eye, the director of such films as "Iron Man," "Iron Man 2" and Cowboys & Aliens" delivers a visually stunning and beautifully told version of "The Jungle Book." We all know the story. Mowgli (newcomer Neel Sethi, who turns in a fine performance) is a man-cub who's been raised by wolf alpha male Akela (voiced by Giancarlo Esposito), his mate Raksha (Lupita Nyongo), who considers him one of her own cubs, and the rest of their pack. But when all the animals gather during a drought-provoked truce to drink water, the fearsome tiger Shere Khan (Idris Elba) says he'll kill Mowgli before he grows up and puts the jungle in yet more danger. Shere Khan bears the scars of Man, and he is not happy to share the jungle with any human. The wolf pack tries to protect Mowgli, but the boy decides to save his wolf family by returning to a nearby human village. As panther-mentor Bagheera (Ben Kingsley) journeys with Mowgli to the village, Mowgli ends up dealing with various predators who don't have his best interests at heart. 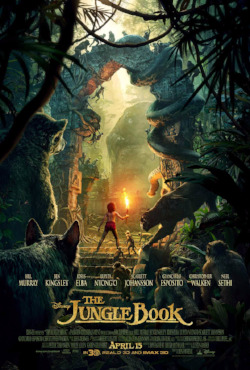 There's Kaa (Scarlett Johansson), a python whose seductive voice and gaze hypnotizes the man-cub, and the smooth-talking King Louie (Christopher Walken), the now-extinct Gigantopithecus orangutan who tries to coerce Mowgli into giving up the secret to the elusive and deadly red flower (fire). Mowgli also befriends a new pal, honey-obsessed bear Baloo (the perfectly-cast Bill Murray). Meanwhile, Shere Khan takes vengeance on the wolf pack for not turning over Mowgli, then lies in wait for the boy to return so he can kill him. The casting for "The Jungle Book" could not have been better. Newcomer Neel Sethi, who's just 12 years old, makes me really care about Mowgli, the youngster who's only known the jungle as his home and doesn't really understand why he has to leave. At the same time, I'm utterly impressed with his ability to make me fully believe that he's in the jungle with these animals instead of acting on a green screen. It's really something. Props also to the casting director for putting Christopher Walken and Bill Murray in their roles. And they both get to sing-talk their way through the iconic tunes "I Wanna Be Like You" (Walken) and "Bare Necessities" (Murray). I so wanted to be floating down that river and humming that tune with Baloo and Mowgli. Idris Elba is perfect as the villainous Shere Khan, who you kind of feel sorry for because even though he's super mean and dangerous, he's just misguided when it comes to humans. And with her sultry voice, Scarlett Johansson is well cast as the giant python Kaa, who hypnotizes Mowgli as she reveals the story of his origins. Also, the jungle landscape is so gorgeous, from the treetops that Mowgli so deftly navigates to the ruins where King Louie lives with his tribe. I saw "The Jungle Book" in the regular 3D version, but might go back and check out the IMAX version. PARENT OVERVIEW: "The Jungle Book" includes several intense, jump-out-of-your-seat moments, including one sad death and a few animal fight scenes involving claws, snarls, fur, etc., which might scare young viewers. On the plus side, there are good messages about family, friendship, teamwork and being brave in the face of adversity. Violence/Gore: Characters die, including one sudden shocking death. The plot ranges from leisurely scenes to scenes of peril and danger. Mowgli occasionally has scratches, wounds and bee stings on his body. Animals fight viciously at times, involving roars, snarls, teeth, fangs, claws and fur. Shere Khan is scary and cruel; Kaa is a little creepy. Several jump-worthy moments when menacing animals pop up suddenly, as well as when the monkeys kidnap Mowgli and King Louie gets angry (he's very big). Forest fire scenes are terrifying for the animals, but Mowgli is brave. A rainstorm results in a mud avalanche that sweeps Mowgli into a raging river. Profanity: "Heck" and "shut up" is as bad as it gets.